Is Marijuana Addictive? How Addictive Is Marijuana? Marijuana is one of the most abused illegal substances in the world. It is also the most used 'second drug' for those addicted to other substances. Approximately one in ten users meets the medical criteria for Cannabis Use Disorder (marijuana addiction). There are physiological, psychological, cognitive and social effects of marijuana addiction. Since they occur insidiously or slowly over a prolonged period, users tend to be unaware of accumulating problems. Poor life outcomes such as low occupational and educational status, low income, and overall poor life satisfaction are also reported. Find Help Today If you see the signs of addiction in yourself or someone you love, don't wait to get help. Find treatment options today. Cravings to use are triggered by brain reactions, reminders of pleasant effects, and psychological cues such as stress and unpleasant feelings. Reduced interest and poor performance in pursuits. Failure to meet obligations and responsibilities. If use is cut down or stopped, withdrawal occurs. Signs of marijuana use are difficult to spot, especially because of the prevalent notion that marijuana is not harmful - one can easily ignore clear symptoms in themselves and loved ones. Negative effects accumulate slowly and are difficult for users to notice. Your loved ones are more likely to see marijuana's effects. Marijuana is a particularly 'tricky' drug. Negative effects accumulate slowly and are difficult for users to notice. Your loved ones are more likely to see marijuana's effects. Research the issue in books, articles and online. Be compassionate and frank, while aiming for fact-based communication. Demonstrating affection, concern and a willingness to help without blaming, or attempting to shame or scare your loved one, establishes rapport and facilitates ongoing communication. Waiting for your loved one 'to hit rock bottom' can be dangerous and traumatic. 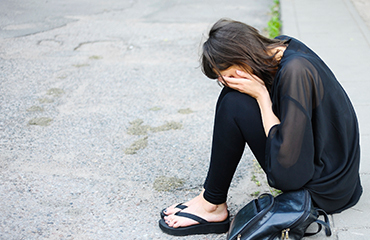 You should address specific concerns as they arise, but not during intoxication. Become educated about marijuana addiction and recovery resources. Ask compassionate questions, offer fact-based help and set reasonable expectations. Sometimes, one may evaluate treatment several times before actually enrolling in a program. Be prepared for a series of discussions. 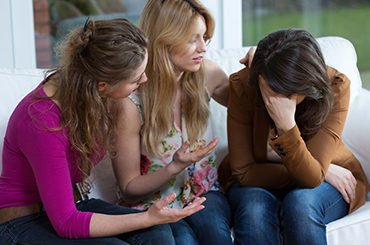 An intervention is not necessarily a formal group confrontation. Individual discussions also have the potential to intervene. Prepare by enhancing self-care and focus upon your own life. This increases awareness of the addiction's negative impact upon you and allows you to cite specific, fact-based information to the addict. It also clarifies the limits and boundaries you need in order to be healthy and to stop enabling. Whether you do it by yourself, in a group or with the assistance of a professional interventionist, the goal is to get the addict to treatment as quickly as possible. Be prepared to do so, but expect resistance, denial and anger. Remain calm, caring and firm about the need for treatment. Develop healthy coping skills and strategies. Give opportunities to process emotions. Address issues of loss, grief and stress management. Support groups also can identify other resources that loved ones may need. In treatment-related groups, for example, a loved one's need for counseling or symptom management can be identified by the group facilitator. Non-12 Step groups, such as SMART Recovery, are also available for friends and family. Marijuana addiction treatment includes outpatient programs, inpatient stays and residential stays. Outpatient Treatment. Outpatient programs are great for those who are unable to step out of their daily routine completely to get sober in a residential facility. Outpatient treatments allows you to continue living at home and maintain your usual life routine. Luxury and Executive Programs. Also, accommodations can be found in private treatment centers with luxury, spa-like amenities. Additionally, executive programs offer amenities and considerations for the executive client who needs to continue some business contact while in treatment. Screening and assessment are the first steps in treatment. Your needs are determined by addiction professionals who make recommendations for your care. An individualized treatment plan is created to address your use, related emotional issues and stressors, relapse prevention planning and needs for living a marijuana-free life. Typically, individual, group and family counseling sessions are recommended. Additionally, if there is a co-occurring mental health problem, many programs offer dual diagnosis services and can help you with mental health conditions in conjunction with your marijuana addiction. A wide range of settings and differing levels of services for marijuana addiction treatment are available, ensuring that individual preferences and needs can be met. Your choice should be made in consultation with an addiction professional, because choosing amongst so many options of varying prices can be overwhelming. Call us today at 1-888-993-3112Who Answers? to speak confidentially to with a treatment support specialist to evaluate the marijuana addiction treatment options available for you. Consultation, particularly with an addiction professional, will help determine the best treatment setting for you. Information is widely available online and through addiction referral services to help you find the setting you agree on. Crisis and information hotlines are also good sources to contact as you research options. Contact programs by phone to discuss entering treatment with them. What services you will receive. How to obtain an assessment and methods of financing your treatment. You can expect to be briefly interviewed when you call so that your individual situation and needs are clearly understood.